Since Wal-Mart was putting out its Christmas candy the day before Halloween, I guess it’s only appropriate that the first Christmas movie of the year is debuting four days later. A Very Harold and Kumar 3D Christmas reunites the cast of the previous two H&K movies (Harold and Kumar Go to White Castle and Harold and Kumar Escape from Guantanamo Bay) for a 3D holiday extravaganza. The movie opens a number of years after the last one. Kumar (Kal Penn) has lost his place in med school due to a failed drug test, and spends his days smoking weed and watching tv. His girlfriend Vanessa (Daneel Harris) has left him, and his only friend is Adrian (Amir Blumenfeld), the nerdy guy across the hall. Harold (John Cho) is married and working on Wall Street, chumming around with suburban dad Todd (Tom Lennon) and trying to put together the perfect Christmas for his father-in-law (Danny Trejo). Harold and Kumar have not spoken for a couple of years. When a package addressed to Harold is delivered to Kumar’s apartment, Kumar and Adrian venture to the ‘burbs to deliver the parcel on their way to a party. Hijinks, as they must, ensue, sending Harold, Kumar, Adrian, and Todd (along with Todd’s toddler daughter) off on a quest for the perfect 12 foot Fraser Fir tree. Along the way, they encounter numerous characters from the previous movies, including Neil Patrick Harris (Neil Patrick Harris). 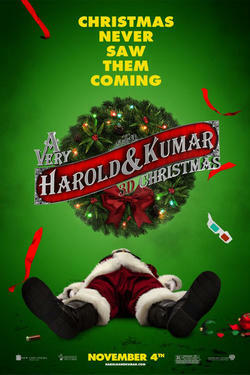 A Very Harold and Kumar 3D Christmas is, at its heart, a Harold and Kumar movie. Meaning crude humor, fantastic situations, and marijuana. Lots of marijuana. I’m not a huge fan of drug humor, but these movies are the exception for me. I find them very funny, and they have a lot of heart. Penn and Cho have great chemistry together, and the movies are knowing enough not to take themselves too seriously. There are numerous inside jokes, including references to Penn’s time in President Obama’s administration and Cho’s role in the Star Trek reboot. Neil Patrick Harris is in a class by himself, as always, playing a bizarro world version of himself, playing off both his real-world out status and the drugging womanizer he’s played in the H&K movies. As its title suggests, this movie is presented in 3D, and while a number of the effects are very good (including, amazingly, raw eggs), the 3D is part of the joke as well. In some instances it works organically into the story, but in others, it’s gratuitous, and knowingly so. Within the framework of the movie, the 3D fits and is very well done. A Very Harold and Kumar 3D Christmas is a Christmas story for the modern age; rude, crude, and heartfelt all at the same time. And I for one am looking forward to the next movie (which NPH himself references).